Volume 149 beinhaltet Beiträge, welche in der Konferenz anlässlich der 250-Jahr-Feier der Universitätssternwarte Wien vorgetragen worden sind. Diese Ausgabe beschäftigt sich mit der Geschichte der Universitätssternwarte und der Astronomie im Allgemeinen. Sowohl historische Persönlichkeiten als auch deren Studien und wissenschaftlichen Erfolge werden hier erörtert. The publication series Communications in Asteroseismology (CoAst) is one of the most important international journals in the field of asteroseismology. Asteroseismology is the science of variable and pulsating stars. Every six months CoAst publishes a newsletter with papers on ongoing research projects. Besides these regular issues, special issues such as conference proceedings or program manuals are published in this series. Volume 149 presents a summary of the conference on the occasion of the 250th anniversary of the University Observatory of the University of Vienna. The papers in these proceedings anthology describe various interesting aspects of the observatory´s long history and portray th careers of past members of the faculty. 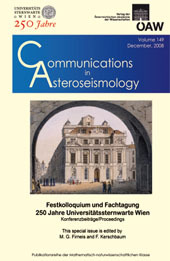 Several contributions report on the current developments in Austrian astronomy.